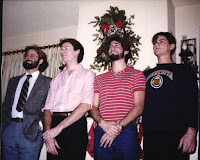 It was a zillion years ago, but my brothers and I used to have a sort of tradition on Thanksgiving eve. After dinner was over the three or four of us would go out to a local tavern and shoot pool. Sometimes it was the Grand Tavern (aka the old O'Connell's, on Grand Avenue) other times it was the Spot Bar. I also remember one time we ended up at the Highland Tap (aka the Highland Trap) which was a 3.2 joint serving only 3.2% beer and wine. A neighbor guy we'd grown up with was tending bar and thought it was cool to see the Landwehr boys all together. When we got there Paul and Rob would say hi to the locals, with Tom and me just along for the ride. We'd put quarters on the table and in the jukebox and spend a couple hours critiquing each others' shots, as brothers are prone to do. We were usually still in our Thanksgiving clothes, so were looking as spanky as we probably could. And as weird as the tradition sounds, I can remember thinking that I would always remember these spontaneous trips on a sacred family holiday. There was something unifying and connecting between the brothers on these once a year outings. We were all beginning our careers and finding our way in the world, so this was a good chance to get below the surface a little and have some fun while doing it. Between all the backslapping, storytelling and laughter, it was a nice addendum to the pleasantries we'd all shared with the rest of the family earlier. Sure it felt a little dirty going to a bar on what should be a family holiday, but if you went with family, well, wasn't that sort of the point? None of us had kids at the time and the three youngest of us were still single, so it seemed like a normal thing to do. The important thing was we were together, solving world problems and enjoying each others' company, if only for a couple hours. I realize these brotherly gatherings were not the Norman Rockwell painting we all dream of as our Thanksgiving celebrations. At the same time, I don't know that I would change the way we did them. I love my whole family and the bonds between me and my brothers are forged of memories that span from fishing and camping, to growing our families together, to hanging out on Thanksgiving shooting a little stick for fun. And this Thanksgiving I'm especially grateful for them.